On Wednesday, I was one of a number of local technologists who were helping local charity Roundabout with discovery sessions for their new project, with the session headed by Founders and Coders and supported by CAST. If you think that sounds like a lot of people and parties involved in one meeting, then you'd be right: but despite that, the whole day still felt focussed and refreshing from the first chats to the last specifications. Roundabout provide support, encouragement and other help for young people in the city. Their focus is on those who might have problems with precarious housing, life skills or other difficult circumstances. Recent funding has permitted them to plan for an app, to try to bridge the gap between the necessarily admin-heavy process that they need to help young people through—goals, targets, skills, awards—and providing an encouraging and engaging experience of that process for them. But how to achieve such a tall order in as efficient and transparent a way as possible? Union Street provided a great venue for our discussions, with their One Space being a perfect size for our group, and their roof terrace a joy to have a sunny summer's lunch on. From the start, discussions and exercises emphasized gearing up for agile project management rather than large up-front specifications and the hidden risks of monolithic software building. 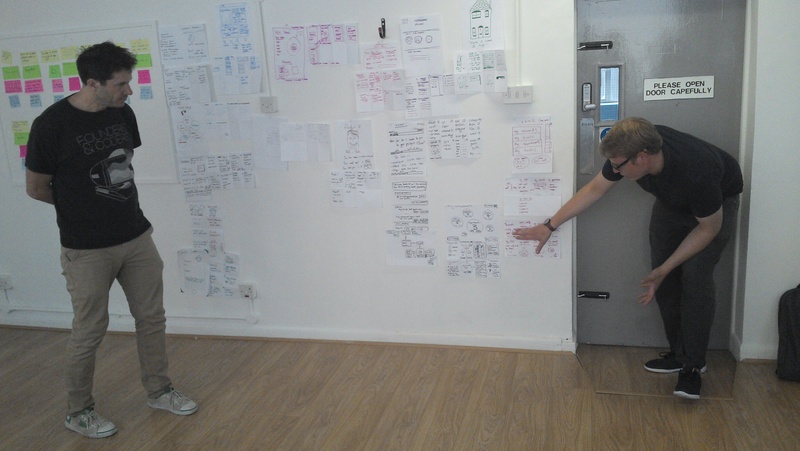 After a quick introduction from Ben at Roundabout, Dan from Founders and Coders led the majority of the sessions, encouraging a broad range of Roundabout's staff through a number of exercises, predominantly through the media of sticky notes. 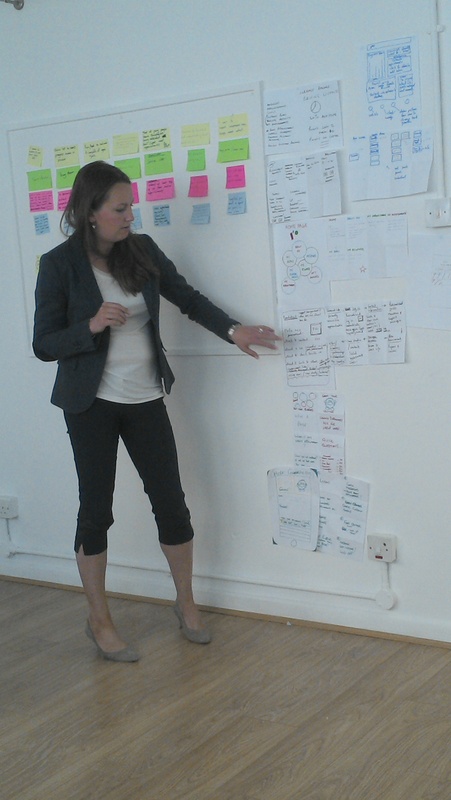 There was existing systems and gap analysis; constructing key user journeys with stories; and, after much discussion, all of us were asked to wireframe and workflow a possible user interface for the application. Which sounds a tall order, but given the simplicity of an A4 sheet folded into eight panels, and the thickness of a sharpie pen, most of us felt the freedom to let rip on the page! the features and gap analysis remains available for reference (left). good ideas produced as a result of the day's efforts! Along with the quantity of what we produced, what struck me was the sheer good quality of ideas, designs, insights and just plain thinking that was going on by the end of the day. It was so different from how many discovery phases proceed, where people might feel they're either being left out, or that they have to drop their own worries or concerns into one end of a process, to leave it to some separate team of "experts" to turn into an indigestible wodge of a specification. Here were the key outcomes of discovery, being built before our eyes. In September, Founders and Coders will help Roundabout with the next phase, spending a week constructing a simple prototype. It's great to think that the prototype will have as its foundations all that high-quality work the discovery team accomplished on Wednesday. I'm looking forward to a great outcome, both for Roundabout and for the young people of Sheffield.